Time Turnkey concept which offers complete activities to promote the development of children as well as professional printable documents to accompany them. (Open weather chart) Print and laminate. Every day, sit in a circle with the children and designate a child to identify the correct pictogram for the day's weather. Variation: The weather chart may be used as a motivational chart for the group. Children choose to have a sunny day (mood). Offer the group a reward (example: playground outing, special lunch, movie with popcorn, etc.) if the sun remains displayed throughout the day. As the day goes by, you may change the pictogram if the majority of the group begins to misbehave or does not respect the rules (example: change the sun to a cloud). We suggests an imaginary game to begin each day. (Open thematic letter-Tic-tac Time) Print the letter. Prepare a special sparkling envelope. Place the envelope in an easy to find place in the daycare. During circle time, have the children find the letter and read portions of the interactive story to them. Follow the instructions. 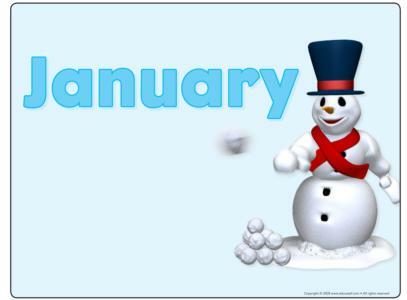 Organize the birthday wall with the monthly balloons. 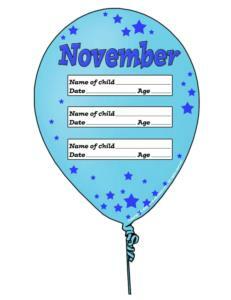 (Open birthday chart) Print and laminate. The pictures may be used as a memory game or to spark a conversation with the group. Use them to decorate the daycare or a specific corner. (Open picture game - time) Print, laminate, and store in a "Ziploc" bag or in your thematic bins. 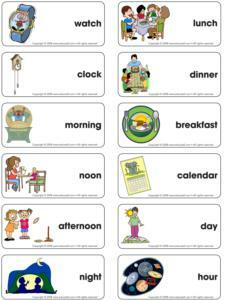 Activity sheets are suggested for each theme. Print and follow instructions. Have fun with these great workshop ideas provided by Caroline Allard. Divide the area into four sections to represent the four seasons. Children may build and create on the surfaces they prefer. For winter, cover the floor with cotton padding. For summer, install a piece of green outdoor rug to imitate grass. For fall, scatter fake leaves on the floor or have children cut some out of construction paper. Finally, for spring, use metallic paper or a blue canvas to resemble water. Set up the role play area with a bedroom and a kitchen to emphasize the difference between night and day. For the bedroom, include a small mattress, stuffed animals, blankets, an alarm clock, a night light... and a window made with a black piece of construction paper, stars, and a moon. For the kitchen, use a table, chairs, a stove, dishes...and a window made with a blue piece of construction paper, a few clouds, a big sun, and a few birds. A little game with musical rhythms...black notes, white notes, round notes. Find a tambourine and ask children to create rhythm. Their peers clap their hands in time to the music. Count dance steps...that is time too! If you can get your hands on a metronome, children will be fascinated! Create dyes with food as our great grandmothers did! Red cabbage juice, mustard powder, blueberry juice, etc. Find scraps of white cotton and enjoy! (Open old and modern objects) Gather old objects or pictures of old objects. If possible, invite a grandparent to visit the daycare to explain how things were in the olden days. Give children flashlights. Close the lights and the curtains to make the daycare as dark as possible, like night-time. Children walk around the daycare using their flashlights to observe objects. Suddenly, turn on the lights back on and say, "Good morning!" Touch a child with a magic wand. Transform him into a baby, child, parent or grandparent. The child who has been transformed must perform the assigned role. Just like in medieval times, plan a grand ball. Children dress up in long gowns and jackets and dance to classical music. (Open moon and sun) Print and laminate. Sit in a circle with the group. When you display the sun, children stand up, dance and move about. When you display the moon, children lie down on the floor and pretend to sleep. Alternate the sun and the moon, this activity provides exercise. Hold a clock in your hands. Stand before the children so they can all see the hands on the clock. Place the hands at a specific time, 3:45 for example. Children must position themselves like the hands of the clock using their arms and legs. Variation: This game may be played with children lying on the floor. This game requires an old clock (tic-tac). Blindfold two or three children. Hide the clock in the daycare. Upon your signal, players attempt to find the clock by listening to the tic-tac sound. Bring your time machine outdoors. Children dress up to travel into the future. See craft below. Lay a blanket on the grass. Hold a timer in your hands. Children lie down on their backs and relax until your timer rings. Encourage them to admire the clouds and use this time to listen to the wind, the birds, and all the wonderful sounds which surround us. Enjoy! Give each child a puzzle. Start a timer or play a song. Children work on their puzzles. When they are done, they shout out their names. The game continues until all the children have succeeded. (Open days of the week) Print, laminate, and cut out. Children have fun associating the days of the week to the colors on the piano. (Open routine game) Print, laminate, and cut out. 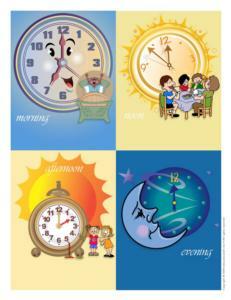 Associate each pictogram to the correct time of day: morning, noon, afternoon, or evening. (Open I'm learning to tell time) Print, laminate, and assemble the clock. Place the small cards indicating times face down on the table. 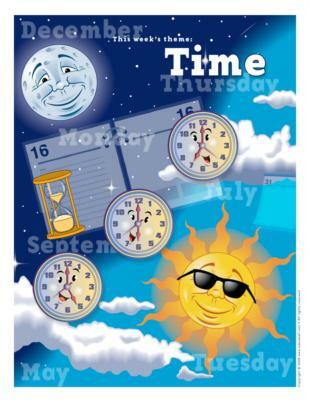 Children pick a card then adjust the hands of the clock to the correct time. (Open visual routine) Have children place the pictograms in the order in which they normally take place at the daycare. Children walk around the daycare for a few minutes (use a timer). They must observe where everything is placed. Have them close their eyes or go to another room momentarily. Make changes in the daycare. (Example: move a chair, hide a lamp, place a picture upside down, etc.) Have children reenter the daycare and ask them to find as many changes as possible within a timed period (using the timer again). When they find the changes they return the objects to their original state. See if they can find all the changes before the timer rings. Children sit in a circle. Play music and have a children pass a clock around the circle. It is important that the clock has hands which turn easily. When the music stops, indicate a number. The child holding the clock must point either the hour hand or the minute hand to this number. (Open night and day) Print the sun and the moon. Use adhesive putty to display the sun on the wall. Leave a space, and do the same with the moon. Have children draw the part of the day which they prefer. Once finished, they hang their drawings on the wall between the sun and the moon in the order in which they occur during the day. The final result will be the schedule of children's favorite activities from morning till night. Have children bring pictures of themselves at various ages to the daycare. Prepare a chronological display for each child. Have children notice that they are growing very fast. Use two plastic bottles. Block the end of one bottle. Make a hole in the center to enable the sand to descend. Put sand in the second bottle and attach the two bottles together with adhesive tape. Invite a grandmother to come bake old-fashioned cookies with the children. (Open clock craft) Print and cut out the different pieces. 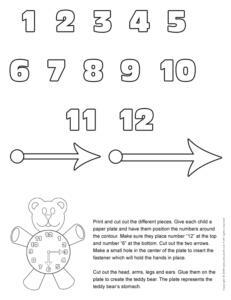 Give each child a paper plate and have them position the numbers around the contour. Make sure they place number "12" at the top and number "6" at the bottom. Cut out the two arrows. Make a small hole in the center of the plate to insert the fastener which will hold the hands in place. Cut out the head, arms, legs and ears. Glue them on the plate to create the teddy bear. The plate represents the teddy bear's stomach. Provide paper, paintbrushes, and paint for the children. Set the timer for five minutes. Children begin to paint when you say, "Go!" When the timer rings, they must stop, even if they have not completed their painting. Find a large cardboard box (refrigerator or dryer for example). Children decorate their time machine as they wish. Don't forget to make a control center...covered with aluminum paper. Use small empty cream containers, buttons, or small beads to create command buttons. Half of a styrofoam ball painted red makes the perfect light for the control center. When the time machine is complete, children can create their very own futuristic gear using plenty of aluminum paper. Use your imagination and better yet, children's imagination.